Students design their art on the computer before instructing the PotterBot to print it. 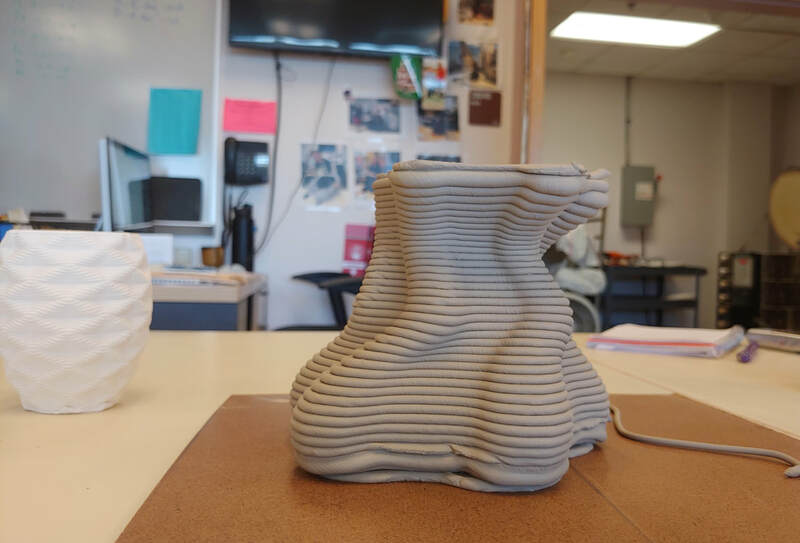 Art and technology intersect at Falmouth High School, where Corine Adams’ ceramics students are expanding their artistic process while also expanding their creative toolbox. 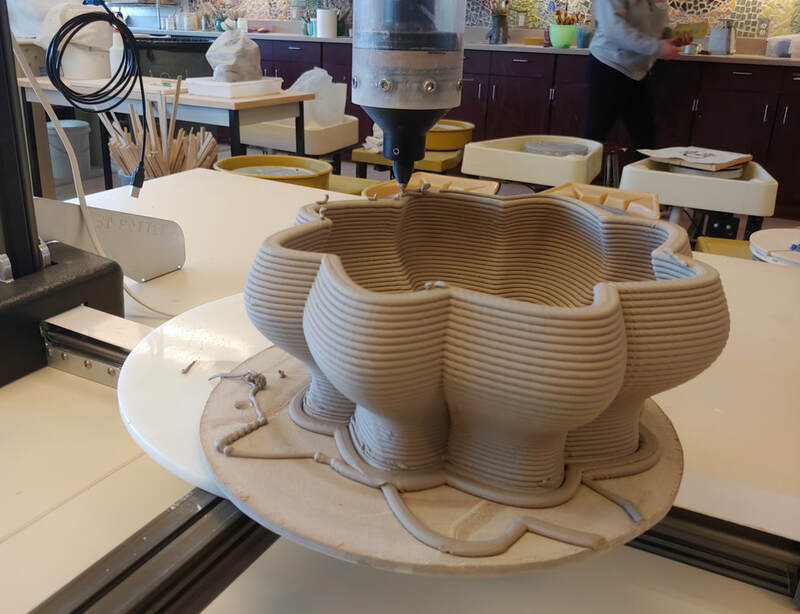 The innovative initiative is part of a Falmouth Education Foundation grant awarded to Mrs. Adams, bringing together ceramics and graphics with the introduction of the PotterBot, a state- of-the art 3D ceramic printer. Mrs. Adams was inspired to apply for an FEF grant for the PotterBot when she attended the NCECA (National Council on Education for the Ceramic Arts) Conference in Pittsburgh last year. There she viewed the printer in action, and witnessed the machine’s potential. As part of the collaboration, students from the FHS Technology Department offered their expertise to the Art Department by setting up the printer, and the young artists are now stepping out of their creative comfort zone by experimenting with digital design. Unlike the traditional method of shaping the clay by hand, the sculptures are outlined using Autodesk Fusion 360, a type of 3D software. In the same way a printer produces paper, the PotterBot produces a sculpture made of clay. The more intricate the design, the longer it takes for the printer to translate from design to fruition. According to Mrs. Adams, the learning curve for the PotterBot varies with each individual. “If you’ve never done 3D design before, it can be tricky. Some struggle with it, and for others, it comes more easily. I tell my students to just focus on doing it step-by-step,” she said. Therefore the students have been working together and sharing their strengths to get acclimated to the software, while also relying on YouTube videos for reference to help reiterate the process. Riley Bird, a student in Mrs. Adams’ Ceramics III Honors class, enjoys the challenge. “It’s a little complicated and takes a while to get used to, but the result is worth it. We wouldn’t be able to do these kinds of detailed shapes using just our hands and clay,” she said. Another draw to the PotterBot is the printer’s ability to produce multiple designs at a time. Therefore, the students had the opportunity to showcase their new skills by creating ceramic centerpieces for FEF’s 2019 Winter Gala at the Coonamessett Inn. The glazed abstract pieces were sold at auction as part of the fundraising event. Ayanna Goffigan also appreciates the chance to learn a new skill. “The 3D printer gives you a lot of freedom to do whatever you want because there are a lot of restrictions with regular clay, and it’s really fast. This is something I want to pursue as a career,” she said. Mrs. Adams credited FEF for recognizing the value of such unique educational opportunities. “Falmouth Education Foundation has supported my classroom in so many ways over the years, from computers to supplies to field trips. None of this would be possible without FEF’s generosity,” she said. At left, PotterBot prints a bowl with clay. Above, a completed vase.